In the heart of Umbria, near the beautiful ancient city of Perugia, Villa Aureli stands like a jewel in a peaceful and hilly countryside. 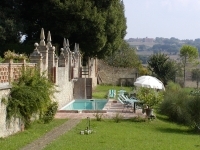 The Villa dates back to the 18th century, when a Perugian nobleman, the count Sperello Aureli, transformed a 16th century tower into his country residence, adorning it with frescoes, prints, stuccowork and furniture, that can still be admired today. 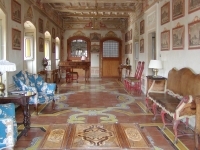 Among the many wonders of the Villa are the ceramic floors, designed room by room according with the decorations of the walls and ceilings, and made in Vietri, near Naples, the bright first floor gallery, the elegant ornamental walls of the garden and the quatrefoil-shaped fountain facing the orangerie, where the sixty large orange and lemon pots of the garden are sheltered during the winter.